When I first began studying wine, I remember reading that the French called the trio of wine, bread and cheese the “holy trinity.” I cannot disagree. However, throw in a spa treatment and life is perfect! What wine, bread and cheese have in common, other than being delicious, are that they are all products of fermentation. But then how does the spa fit in? Well, it fits because it also includes fermentation. If this sounds good to you, then head down the scenic Bohemian Highway to Freestone, Sonoma’s first historic district. Freestone’s population is only 32 but it is home to the “fermentation corner” with includes a winery, bakery, cheese store and spa. 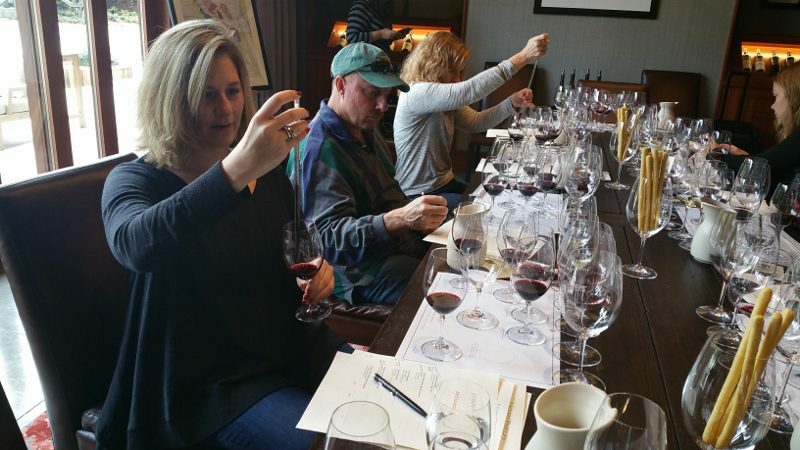 It is not uncommon to get “insider” experiences at a winery. A behind-the-scenes tour of the winery production equipment or a barrel tasting of upcoming vintages is typical winery tour experiences. 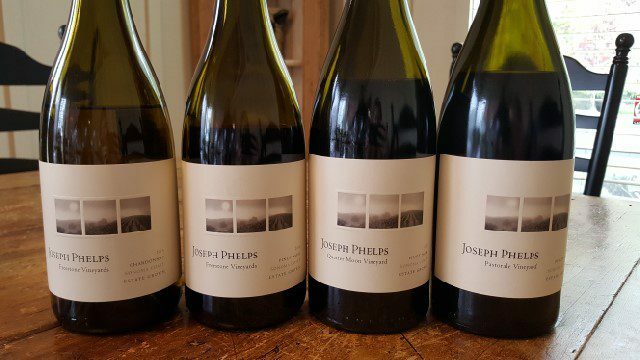 But at Joseph Phelps, they offer what they call “Exceptional Wine Experiences”. They offer a single vineyard tasting where you can discover how the soil and microclimate affect the varietal selection. There is a barrel aging tasting where you can taste cabernet sauvignon wines aged in different barrels and learn about the influence of oak on wine. They also offer a wine aroma challenge, a wine and cheese pairing and a vertical tasting of five vintages of Insignia. I opted for the chance to play winemaker and learn about the art of blending different wines and the blend we were attempting to make was the famous Insignia. Insignia was created by Joseph Phelps, who Robert Parker called “one of the greatest visionaries of Napa Valley.” Phelps was running Hensel Phelps Construction, one of the largest construction companies in the U.S., when he came to Napa Valley for a project. In 1973, he purchased a 600-acre former cattle ranch and began planting vineyards. The winery was completed in 1974. In that same year Insignia, the Phelps flagship wine, was produced. Insignia is a Cabernet Sauvignon based wine produced from six of the Joseph Phelps estate vineyards: Spring Valley Home Ranch (St. Helena), Banca Dorada Vineyard (Rutherford Bench), Las Rocas and Barboza Vineyards (Stags Leap District), Yountville Vineyard (Oak Knoll District) and Suscol Vineyard (South Napa Valley). It is made with only the highest quality grapes and a minimum of at least Bordeaux varietals. For the past twenty years it has been Cabernet Sauvignon dominant but that is not a requirement. Until his death in 2015, Joseph Phelps insisted that there was no recipe for Insignia; it is an art. To start, we were given samples of the six different wines that are used to make Insignia. We were instructed to make the blend of our choosing. We each tasted through the six wines. The 2012 Merlot from the Yountville Vineyard had a smoky nose and soft acid on the mid-palate. The 2012 Malbec from the Spring Valley Home Ranch Vineyard/Suscol had medium tannins. The 2012 Cabernet Sauvignon from the Suscol Vineyard had notes of dark fruit while the 2012 Cabernet Sauvignon from the Barboza and Las Rocas Vineyards had notes of tobacco with bright tannins. The other two wines were the 2012 Cabernet Franc from the Suscol Vineyard and the 2012 Petit Verdot from the Spring Valley Home Ranch Vineyard. I was a big fan of the Cabernet Sauvignon from the Barboza and Las Rocas Vineyards so in my first blend I used fifty percent of it, followed by twenty-five percent of the Cabernet Franc and twenty-five percent of the Petit Verdot. I was happy with my blend that had a balance of earth and spice with bright tannins. On my next attempt, I used forty-five percent of the Barboza and Las Rocas Vineyards Cabernet Sauvignon, twenty percent Petit Verdot, twenty percent Cabernet Franc, ten percent Malbec and ten percent Merlot. Again, I was rather pleased with my blend which had more red and black fruit notes and a silky finish with both acidity and medium tannins. I kept playing around, using the same grapes but trying different percentages, to see how a little more of one or a little less of another might affect the taste. In general, the blends were well-balanced and I thought tasted good; but did any of us make a blend to match Insignia? Everyone at the table was enjoying themselves, trying different combinations, having their friends try them and sharing what they liked and did not like about each wine. Each of us at the table had different opinions and different palates. Some people made a darker, earthier and more tannic blend and others went for a lighter, fruitier style. After we finished blending, we tasted the 2012 Insignia, the current vintage of the wine. Made with seventy-five percent Cabernet Sauvignon, ten percent Petit Verdot, ten percent Merlot, three percent Malbec and two percent Cabernet Franc, this final blend was determined by a team of four people who must be in unanimous agreement that it is the best possible blend. The wine is an inky dark color and has aromas of ripe blackberries, cigar box and clove. On the palate, the wine has a velvety texture and is full-bodied. It was fun to play winemaker for the day but it is a lot of pressure to make a blend that everyone will like. Fortunately, the future of Insignia does not fall on my shoulders.